Click here to read the online version of the January “Connections” newsletter with exclusive details about the Jan. 21 Violins of Hope event at Newport. 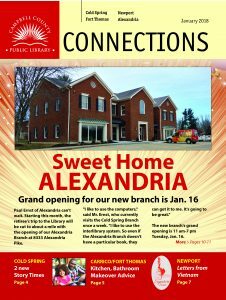 Read all about the grand opening of our new Alexandria Branch in the January “Connections” newsletter. In addition, this online version of the newsletter includes exclusive details about the special Jan. 21 Violins of Hope presentation at our Newport Branch. Learn about Love 19th Century American Style with Northern Kentucky University history professor Dr. Burke Miller as the City Barbeque Food for Thought series kicks off 6:30 pm Tuesday, Jan. 30 at Cold Spring. Two new Story Times debut at Cold Spring: Evening Story Time, 6:30 pm Wednesday, Jan. 10; and Family Story Time, 10 am Saturdays, beginning Jan. 20. At Carrico/Fort Thomas, learn what to expect and how to prepare for a kitchen remodel 6:30 pm Thursday, Jan. 18, and a bathroom remodel 6:30 pm Thursday, Jan. 25. At Newport, Falcon Takes Flight, a wing of Falcon Theatre, presents Letters from Vietnam as part of our Signature Series, 7 pm Friday, Jan. 12. There’s so much more at the Library in January. Read all about it here.